The new CSU+ service allows you to request books and media from any of the 23 CSU libraries and have them delivered (for free!) to Cal Maritime. Thanks to a speedy courier service, our students, faculty, and staff will be able to receive requested materials in 2-4 days. Starting Monday, July 10, CSU+ is replacing our former requesting service, Link+. While Link+ only included ten other CSU libraries, all 23 will be participating in CSU+. 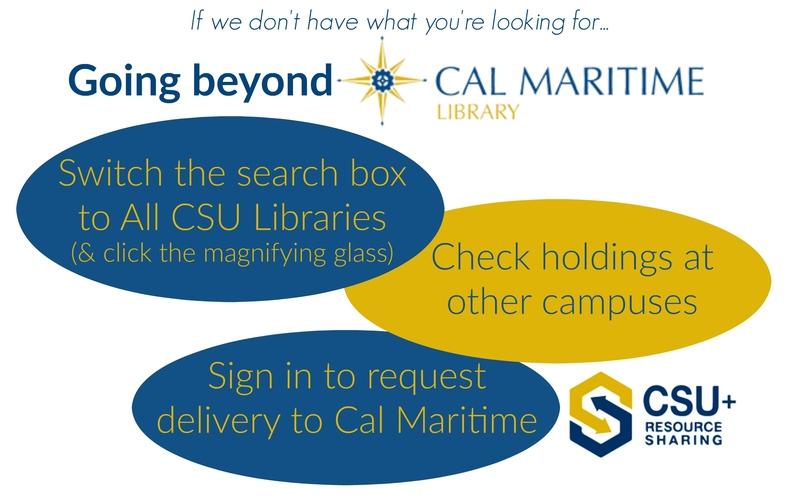 The new CSU+ service has several benefits, including simpler searching, no overdue fines, and longer loan periods. You can borrow books through CSU+ for 60 days, and media through CSU+ (DVDs, CDs, etc) for 30 days.